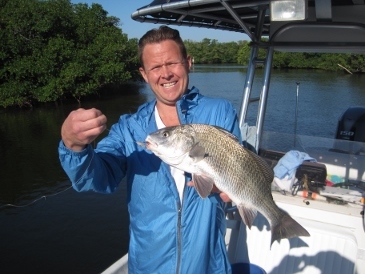 SWFL-Bonita Beach: Inshore on a good tide; Offshore in calm seas-Fishing is great! :cool:Friday morning, 12/2, predictions were for two-to-four foot seas offshore. Bob Eckle and friend, Ken weren’t fazed by that, since they are both hardy, avid anglers. It was pretty rough out there for the first half of the morning, then calmed a bit after the wind shifted. The guys had a good time using squid to catch twenty-five red grouper shorts, twenty-five grunts, and four porgies. They kept four grunts and one porgy for dinner, and released the rest. Steve Tippman, his sons, Adam and Josh, and his grandson, Liam, had planned to spend a full-day fishing offshore to celebrate Liam’s eleventh birthday on Saturday, 12/3. With winds howling over-night, we awoke to a small-craft caution, with seas of two-to-four within 20 miles of shore, and rougher beyond 20 miles. So the boys decided to do a half-day of fishing as far out as we could get without getting into the roughest of seas. We settled on a spot about 17 miles west of New Pass, where the guys used squid to catch and release twenty red grouper shorts, two 13-inch out-of-season, short triggerfish, and a puffer-fish. They also caught twenty-five grunts to 13 inches, and kept the fifteen largest of those, along with three 13-inch porgies, the largest of the five porgies they caught. So, all-in-all, it was a fun day of fishing, a nice birthday celebration for Liam, and a fish dinner in the planning! Monday morning, 12/5, winds blew pretty hard and it was choppy heading out to twenty miles west of New Pass. But my long-time customers and hardy anglers, Mike Connealy and his son, Clint, didn’t mind a little chop. They used squid to catch sixteen red grouper, including a keeper at 23 inches, along with thirty grunts to 14 inches, of which they kept six, and five porgies to 13 inches, of which they kept two. They also caught a 13-inch margate. Tuesday, 12/6, I had planned an offshore trip with four guys who were looking forward to it. But Mother Nature threw us a loop, as a front came through, bringing high winds and seas and small craft advisories. The water was pretty much sucked out of the bay with the approach of that front, so fishing good options were pretty much nil, and we cancelled the trip. By Wednesday morning, 12/7, winds had died down and, though there was a residual swell when I headed offshore that morning, seas were pretty calm, even 27 miles out. Mike Connealy, who had fished with me Monday, fished again, this time with friend, Sherri Scharff. Using baitfish, Sherri landed two keeper red grouper at 21 inches and 23 inches. The anglers also used squid to catch and release 25 additional red grouper that fell short of keeper size, to 18 inches, along with twenty grunts to 14 inches that they chose to release, and one out-of-season triggerfish that measured 14 ½ inches. As for the fish box, along with the two keeper grouper, they added brace of 11-inch keeper lane snapper. We were cut off by big sharks a couple of times, but couldn’t make out what kind they were. Thursday morning, 12/8, was a drizzly, windy one. I fished the backwaters of south Estero Bay with Paul Farrell and his cousin, Brian. Using live shrimp, the guys caught and released a 28-inch black drum, along with a couple of sheepshead shorts and a mangrove snapper short. There were lots of drum around the boat, but most were being finicky and not biting. Friday morning, 12/9, another windy one, I fished a catch-and-release trip with Joe Hahn in south Estero Bay, where we released a total of thirty-two fish, including lots of sheepshead, three spade fish, a brace of 18-inch black drum, a mangrove snapper, a 13-inch mutton snapper, a few pufferfish, and a couple of ladyfish. Everything bit on live shrimp. Monday morning, 12/12, I was glad to see calm seas in the forecast and light winds out the window, after a pretty blustery weekend had passed. I headed offshore with long-time customers, brothers Robin and Irv Latham. Using squid, the guys caught twenty grunts to 13 inches and kept the largest ten of those. They also caught four keeper lane snapper and might have caught more of those in that spot, had the barracuda not shown up. At our next spot, we released eight red grouper shorts to 19 ½ inches, just a bit shy of keeper size, before the goliath grouper showed up there. By that time it was time to head in, so we surrendered to the big sea predators, having enough fish in the box to meet the Latham family’s needs. Tom Rylander, joined by his son and two family friends, Rich and Bob, fished 20 miles west of New Pass with me on Tuesday morning, 12/13/16, using squid for bait. The guys caught a 23-inch keeper red grouper, and released a half-dozen red grouper shorts. They added to the fish box fifteen of the thirty grunts they caught, to 14 inches, along with six keeper lane snapper. They released two out-of-season triggerfish at 12 inches and 15 inches. 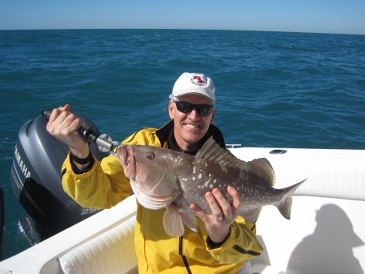 The photo shown is of Jeff Ralson with a 25-inch red grouper, caught on squid on a recent offshore trip. The photo shown is of Sean O’Malley with a 22-inch black drum caught on shrimp on a recent inshore trip.